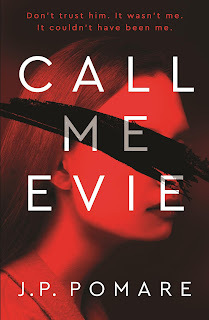 Putting aside the never-ending discussions of why "literary" and what it's telegraphing about the position of crime fiction in the literary world (let's just leave sales figures and reader engagement to speak for themselves), there is much about CALL ME EVIE that's classic psychological thriller, and much that's slightly different and cleverly constructed. Construction is possibly the key point here, the book is divided into parts, with the chapters within the parts headed "before <" and "> after". Told in the voice of central character "Kate / Evie" the action moves between these timelines. "before <" is all about her life as a teenager in Melbourne, daughter of a former sports star father, and a mother who died when she was a very young child. In this viewpoint she's a stereotypical teenager, struggling with one of those all too common bitchy all-encompassing friendships that are toxic and unbreakable when you're that age, as well as her growing attraction to "the" boy in their social circle. It's littered with the sorts of issues you'd expect of teenagers nowadays - access to phones, complicated engagements with parents, fraught social pressures, emerging independence and conflicts around love and developing sexual identity. The "> after" viewpoint is all set within the escape hole of New Zealand, and Kate/Evie's voice is more hesitant, more damaged, scared, vulnerable and obviously haunted by something that's happened in the recent past. Her relationship with the controlling and sometimes quite compassionate man isn't explained, her status of victim / captive / co-conspirator hard to define.